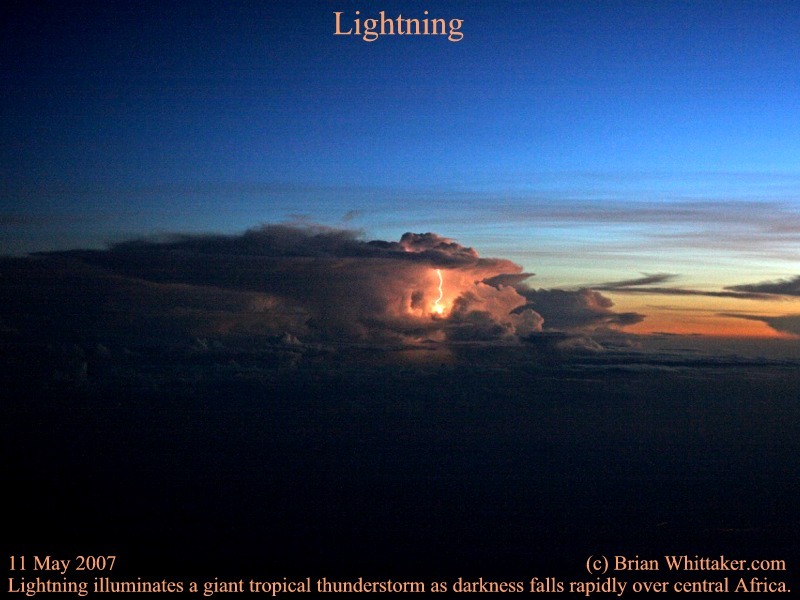 A bright flash of Lightning [Lightning] illuminates a giant tropical Thunderstorm [Thundercloud] just as dusk brings darkness to central Africa. Although it is perfectly calm while airborne at 41,000 feet watching this spectacular show in the distant sunset, the residence below will be experiencing torrential rains underneath 10 miles of thick cloud, in total darkness. Africa often has areas of huge thunderclouds which get predicted on weather charts [charts]. Satellites also show their latest locations [Satellite]. Approximate location: N04, W035. Canon EOS D400 (XTi). 11 May 2007, 1623z. [800x600].